Last year Surfer Magazine named their choices for the top 10 US surf towns. Here they are, and as you can see, South Padre, Corpus Christi, Port Aransas, and Galveston are still US surfing’s best kept secrets. I saw the founder of Quicksilver by Bob Hall one time; even the insiders are keeping their lips sealed about the 8-12 foot waves, beach privacy, and warm water on the Texas gulf. It looks fun because it is fun. 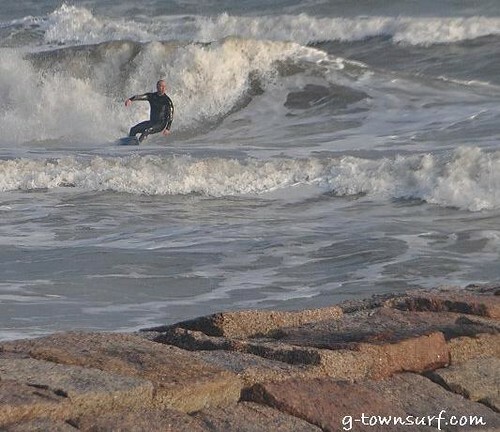 Fun Surf on the Texas Coast Today! This is all surfing in Texas. Thin/Athletic Men/Women & Large Groms: You’ll have the most fun on a mid-sized surfboard, anywhere from 6-8 feet long. Everyone: Your surfboard needs to be at least 4 inches taller than you. Thin/Athletic/Large Men/Women & Large Groms when the surf is really small. Thin/Athletic/Large Men/Women & Large Groms who feel like taking it easy and having an enjoyable surf. If you’re a large adult, forget about it until you’ve changed your body composition; a shortboard simply won’t hold you right now. If you’re a grom, go for it. If you’re a thin/athletic man/woman or large grom and the surf is hitting really hard (lots of power behind it, difficult to paddle through), you have a good chance of having a lot of fun on a shortboard. One thing to keep in mind as you look through surfboards to use in Texas is that a surfboard isn’t a boat. These boards are really thin, so most of the “float” comes from the surface area of the board. Basically, this can be interpreted as: the smaller the body, the shorter the board needs to be. The larger the body, the longer the board needs to be. Also, the weaker the waves, the longer the board needs to be, and the stronger the waves are, the shorter the board needs to be. If you are an adult or college-age and you’re learning to surf in Texas, you need to purchase a longboard. It is possible to learn how to surf on a shortboard at these ages, but it’s very, very difficult! Learning to surf on a longboard at these ages is enough of a challenge; don’t make it harder on yourself by starting out with a shortboard. You can always “graduate” to a shortboard in the future. And remember: The best surfer out there is the one having the most fun. Don’t worry about showing off, just have a blast!